At the Warren Spahn Awards Gala we give out three different awards. The Warren Spahn Award is given to the best left handed pitcher in Major League Baseball. The Ferguson Jenkins and Michele Smith awards are given to the 10 best high school baseball and softball players in the state of Oklahoma. You can read more about the incredible people these awards are named after below. 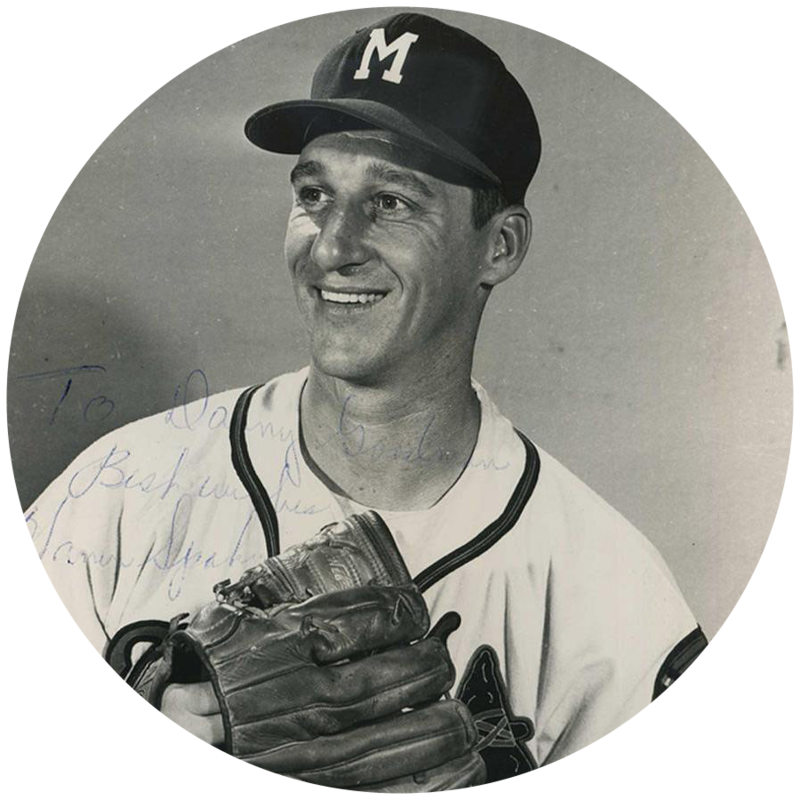 The winningest lefthanded pitcher of all time, and possibly the best as well, Warren Spahn was a complete player who helped himself at bat and in the field. He was the mainstay of the Braves' pitching staff for two decades. Spahn won 20 games a ML record-tying 13 times, pitched two no-hitters, and led the NL in strikeouts four consecutive years. He had a deceptive pickoff move to first base, and teammate Johnny Sain called him "one of the smartest men ever to play the game. "Spahn's career was delayed by WWII, and he did not earn his first ML win until 1946 at the age of 25. He had been with the Braves in the spring of 1942, but was reportedly sent down to the minors by manager Casey Stengel because he refused to brush back Pee Wee Reese in an exhibition game. Spahn relied mostly on a fastball and curve, and had a modest 8-5 record, but in 1947 he was 21-10 and led the NL in ERA (2.33). Spahn's emergence coincided with the Braves' resurgence - a third-place finish in 1947 and a NL pennant in 1948 - and in 1948 he was immortalized in baseball lore by the jingle "Spahn and Sain and pray for rain," a reference to the Braves' lack of pitching depth. Oddly enough, 1948 was actually Spahn's worst season until 1964. He was only 15-12 with a relatively high 3.71 ERA. He managed to win key assignments, including a 14-inning 2-1 win over the Dodgers that put the Braves in first place for good, and his 5-2/3 innings of one-hit relief won Game Five of the WS, which the Braves lost to Cleveland in six games. From 1949 to 1963, Spahn was clearly baseball's most successful lefthander. He won 20 games 12 times in 15 seasons, led the NL in wins eight times, and never had an ERA above 3.50. He won consistently pitching for Braves clubs that ranged from seventh place to World Champions. He was aided by the addition of two new pitches: a wicked screwball that became more important as his fastball lost its pop, and a slider that gave him four quality pitches. Spahn was back with the Braves in 1946 and had the first of thirteen 20-win seasons the following season. Looking back on his military experience some years later, Spahn said, "After what I went through overseason, I never thought of anything I was told to do in baseball as hard work. You get over feeling like that when you spend days on end sleeping in frozen tank tracks in enemy threatened territory. The Army taught me something about challenges and about what's important and what isn't. Everything I tackle in baseball and in life I take as a challenge rather than work." () from Baseball in World War II Europe, by Gary Bedingfield. He won 21 games in both 1949 and 1950, and 22 in 1951, but fell off to 14-19 (with a still-excellent 2.98 ERA) in 1952 as the Braves finished 32 games out in their last year in Boston. A June 15 loss to the Cubs that year typified Spahn's frustration. He fanned 18 batters in 15 innings and hit a solo home run, but lost, 2-1. Spahn turned down a contract that would have paid him 10 cents a head based on home attendance in 1953, and the decision proved costly when the Braves moved to Milwaukee and attendance skyrocketed. Spahn led the NL in ERA in 1953, and failed to win 20 games only once between 1953 and 1961, as he began to master changing speeds and location to keep hitters off balance. Braves pitching coach Whitlow Wyatt said, "He makes my job easy. Every pitch he throws has an idea behind it." In 1957, at the age of 36, Spahn led the Braves to the pennant with a 21-11, 2.69 record, and began a string of five consecutive seasons leading the NL in wins. In the WS, he won Game Four in relief as the Braves beat the Yankees in seven games. He also won the Cy Young Award. Spahn improved to 22-11 in 1958, and won two more games in the WS rematch with the Yankees, in which New York prevailed. The Braves lost a playoff against the Dodgers in 1959, and would never again reach the WS during Spahn's tenure, but several personal milestones remained. On September 16, 1960, Spahn pitched the first no-hitter of his career against the Phillies, and the 4-0 win was his 20th of the season. The following year he no-hit the Giants 1-0 on April 28, five days after his 40th birthday. Then, on August 11, he beat the Cubs in a packed Milwaukee County Stadium for his 300th victory. Despite slumping to 18-14 in 1962, Spahn still led the NL in complete games and had a 3.04 ERA, and in 1963, at the age of 42, he tied his career-best record with a 23-7 mark. It was his last hurrah. Spahn had been overtaken by Sandy Koufax as the NL's premier lefthander, and his ERA ballooned to 5.29 in 1964 when he spent much of the summer in the bullpen. A further indignity occurred in the off-season, when he was sold to the fledgling New York Mets. He started 4-12 for the Mets in 1965 and was released in July, then added three more wins for the Giants before being released again. He was elected to the Hall of Fame in 1973, his first year of eligibility, holding the NL record for career home runs by a pitcher with 35.